Here we preview the suitable Cricket cell phones for seniors, and Cricket Wireless plans. Also, we’ll show the AARP members how to get a discount when purchasing a new phone from Cricket. Cricket Wireless plans starts as low as $25 per month for unlimited talk and texts; this plan comes with no data. You can get 2GB of high-speed data plus the unlimited talk and texts for $30. Starting from the $40 plan, which gives you unlimited talk, texts, and 5 GB of data, you you’re eligible to use the auto pay credit and get a monthly $5 discount. Below is the list of the Cricket Wireless monthly Plans. The $25 plan: Unlimited talk and text (no data included). The $30 plan: Unlimited talk, text, and 2GB of high-speed data. The $40 plan: Unlimited talk, text, and 5GB of data. The $35 plan: Unlimited talk, text, and 5GB of data with auto pay credit. The $55 plan: Unlimited talk, text, and unlimited data at maximum speed of 3 MP. The $50 plan: Unlimited talk, text, and unlimited data at maximum speed of 3 MP with auto pay credit. The $60 plan: Unlimited talk, text, and unlimited data at 4G speeds. The $55 plan: Unlimited talk, text, and unlimited data at 4G speeds with auto pay credit. Unlimited talk, texts, and data at maximum speed of 3 MP, after 22 GB of data Cricket may slow speed. 2 shared lines for $80. 3 shared lines for $90. 4 shared lines for $100. Cricket offers free phones for new customers who switch to Cricket. Models like Samsung Galaxy Amp Prime 3, Samsung Galaxy J2 Pure, LG Fortune 2, Alcatel TETRA are offered for free with number transfer. 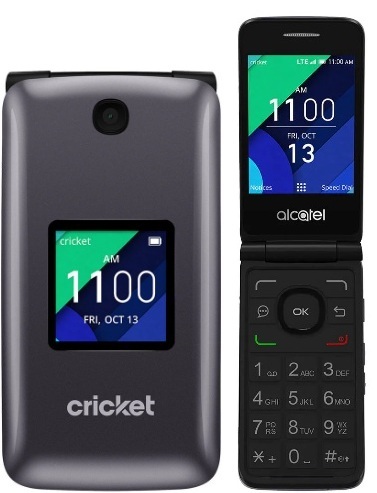 The Alcatel QUICKFLIP is a good example for the Cricket flip phones that fit senior citizens who don’t need a smartphone. Below are the phone features. The phone Full Retail Price is $59.99, and is offered for $30 for the new customers or upgrade. This Cricket flip phone is available with Talk & Text, 2 GB, 5 GB plans. 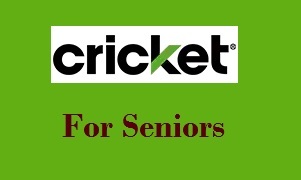 Cricket AARP discount is a 20$ discount mail in rebate when an AARP member buy a new cell phone from Cricket.